The #GiveContinuum Challenge is a 5-day social media challenge (April 8th-12th) to raise awareness about the AIGA DC Design Continuum Fund Scholarship program. The program awards scholarships to underrepresented students pursuing an education in design, photography, and illustration in DC, MD, and VA. With the 2019-2020 application deadline approaching fast (apply by April 24), we invite the local creative community to take part in the #GiveContinuum challenge. Participate and be part of something big! This year, we are awarding 10 scholarships and we need your help raising awareness among students and educators in the area. To participate in the challenge, follow @aigadc on social media and complete any or all of the 5 daily prompts. All entries must tag @aigadc on twitter, facebook and/or instagram to enter for a chance to win a prize each day. The AIGA DC Design Continuum Fund awards scholarships to talented students pursuing an education in design, photography, and illustration in DC, MD, and VA. The scholarship is open to high school seniors, graduate and undergraduate students. THE CHALLENGE: Do you know any talented students looking for scholarships? Do you know any educators that would like to help promote our scholarship initiative? If so, send some motivation their way by tagging them in a #GiveContinuum #MotivationMonday post. Participate for a chance to win a book from Adam J Kurtz. To enter the contest, repost this, this, or use an image of your choice, and be sure to tag @aigadc #GiveContinuum. Don’t forget to direct people to learn more about the program at givecontinuum.org! Contest closes at midnight. The winner will be randomly selected and contacted via DM. Scholarships change lives. Today’s #GiveContinum challenge seeks to gather stories about the impact that scholarships have in the lives of aspiring creative professionals. THE CHALLENGE: Have you experienced or witnessed the transformative power of scholarships? If so, tell us about it by sharing a #TransformationTuesday post and tagging @aigadc and #GiveContinuum. Participate for chance to win a plate tagged by DC graffiti artist Kelly Towles (@KellyTowles). Contest closes at midnight. The winner will be randomly selected and contacted via DM. According to the 2017 Design Census, a male designer is 44% more likely than a female designer to earn more than $80K or higher annually. The AIGA DC Design Continuum Fund aims to support underrepresented students, including women pursuing an education in design, illustration, and photography. THE CHALLENGE: Post a #womencrushwednesday #wcw post featuring your favorite women creative(s) in DC, Maryland, and Virginia. Tell us why supporting the next generation of female creative leaders is important and help us raise awareness about #GiveContinuum. Post and tag @aigadc to participate for chance to win a signed poster by Gail Anderson (@gailycurl) All entries must be shared publicly. Contest closes at midnight. The winner will be randomly selected and contacted via DM. Did you know that a percentage of every @aigadc event benefits the AIGA DC Design Continuum Scholarship Fund? THE CHALLENGE: We invite you to share a #ThrowbackThursday #TBT post that reflects your involvement with AIGA DC and/or #GiveContinuum. Tell the next generation of creative professional why this community is important to you and invite them to be part of it. Post and tag @aigadc to participate for chance to win a plate tagged by Kelly Towles. Contest closes at midnight. The winner will be randomly selected and contacted via DM. 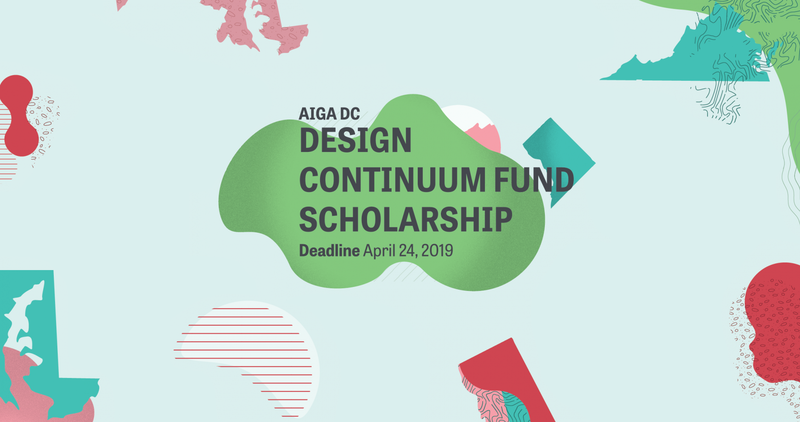 Applications for the 2019-2020 AIGA DC Design Continuum Fund scholarships close on April 24. With 10 scholarships to award, we are giving the community one last chance to participate in the #GiveContinuum Challenge. THE CHALLENGE: If you couldn’t complete the prompts throughout the week, this is your last chance to submit your entry. This #FlashbackFriday, share a late #MotivationMonday, #TransformationTuesday, #WCW, #TBT or a #FBF to help us spread the word about #GiveContinuum. Post and tag @aigadc to participate for chance to win one of the daily prizes or the grand prize, a free 1-year membership to @aigadesign. Already a member? The winner will have the option to gift the membership. Description of all the challenges can be found at givecontinuum.org/givecontinuumchallenge. Contest closes at midnight. The winner will be randomly selected and contacted via DM. Winners for the #GiveContinuum Challenge will be selected and announced on Monday, April 15. Thank you to 2018 recipient Ashley Fletcher, for rendering this year’s promo graphics.